Two people on JUMP bikes. Uber is just the latest company to get into the bike-sharing and scooter-sharing market in the Phoenix area. Uber is expanding beyond ridesharing in the Phoenix area, adding bike- and scooter-sharing programs in Scottsdale and Mesa starting Tuesday. According to a release from Uber, the company is moving more than 1,000 JUMP electric bikes and scooters into the two cities. Uber purchased JUMP ebikes last year. Uber joins scooter-sharing companies Bird and Razor, as well as Grid, Spin, Lime and Ofo bikes in the Phoenix area. 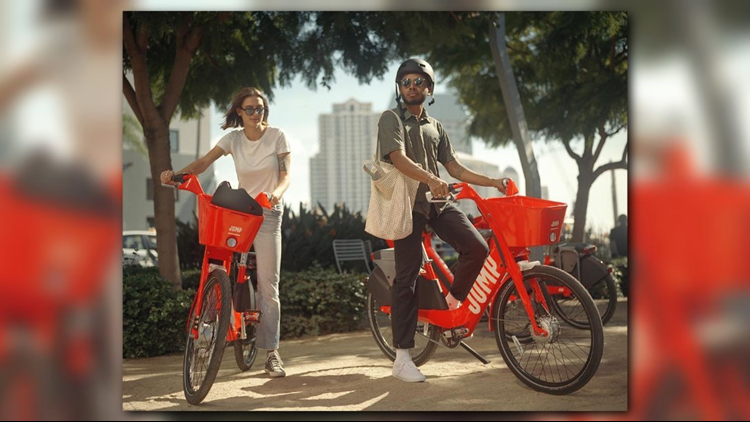 JUMP bikes have already rolled out in Denver and San Diego, Uber says. The scooters are free to unlock, then 15 cents per minute during your ride. The bikes, which include an electric engine, are also free to unlock, but they'll cost the same 15 cents per minute. Until Feb. 4, though, you can ride for free up to five times per day as part of a rollout promotion. The service area in Scottsdale runs from 56th Street east to Pima Road and from McKellips Road north to Indian Bend. In Mesa, the area is between Loop 101 east to Lindsay Road and from US 60 north to McKellips. Uber also has the JUMP Boost Plan for low-income riders. For $5, those riders can ride JUMP for up to 60 minutes per day for a whole year. In order to join that program, riders have to verify enrollment in a low-income program (Arizona Health Care Cost Containment System; Short Term Crisis Services; The Arizona Cash Assistance Program; Arizona Nutrition Assistance; and/or Section 8). If you're interested in using the program but are concerned about safety, Uber is passing out free helmets at its Green Light Hub near Broadway and Priest Drive in Tempe on Mondays, Wednesdays and Fridays from 10 a.m. to 5 p.m. until Feb. 4. You can access both the bikes and the scooters through the Uber app. Uber has a complicated history with rolling out new technology in the Valley. Last year, a self-driving Uber car struck and killed a woman in Tempe, leading the company to wind down its self-driving operations in Arizona. If you want to learn more about Uber's JUMP bikes and scooters, visit the JUMP website.